The monster mortar, cast by Mr. Carles Knapp, at his celebrated iron works in Pittsburg, Pa., was used for a short time in the summer of 1864, during the siege operations in front of Petersburg. Owing to its immense weight, 17,120 pounds, it was transported from City Point on a railway truck along the City Point and Petersburg Railroad, to a point in the ravine in rear of what is now generally known as Battery No. 5, near the Jordan House, a side track from the main road being constructed especially for the purpose of moving it. The position selected from which to fire it, was admirably concealed from the ever-vigilant eye of the enemy. The truck was so strong and substantially built as to answer a platform for the mortar. The Dictator is a 13-inch mortar, firing a shell weighing two hundred pounds, with a charge of twenty pounds of powder. 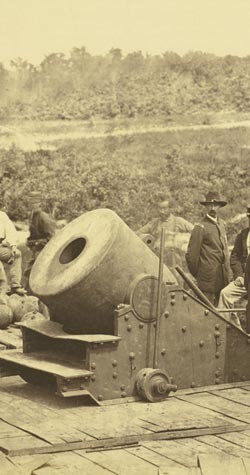 At an angle of elevation of forty-five degrees the range is set down in the Ordnance Manual at 4,235 yards; but, if it is true that the shell thrown by it reached Centre Hill, in Petersburg, as the writer was informed by a very reliable gentleman of that city, then it must have been carried at least 2.7 miles, or 4,752 yards. The bursting of the shell was described as terrific, an immense crater being formed in the ground where it fell, and earth, stones, and sod being scattered in every direction, much to the consternation of the inhabitants of the place.